Catching Fire by Suzanne Collins. Scholastic. Publication Date September 2009. Reviewed from ARC from BEA. Have you read The Hunger Games ? You really, really should. For purposes of awards and lists and the like, I can argue that Catching Fire stands alone. For the potential reader? 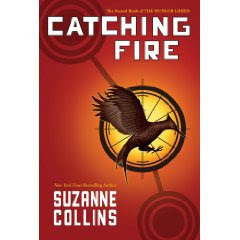 Read The Hunger Games, knowing you only have to wait a few short months to read the sequel, Catching Fire. It's a wonderful experience for a reader: great plotting, memorable plotting, a unique world. And in all honesty, once you've read the first, you don't need to read a review or recommendation to read the second. On to the sequel. It delivers! Brings the reader up to speed on what is happening? Check. Ups the action and investment? Check. The main character grows, including becoming more aware of her world? Check. Oh, you're that one person who hasn't even heard of The Hunger Games? Briefly, future world where 12 Districts pay tribute to the Capital each year; a tribute of two teens, sent to fight to the death. Twenty four enter an arena that is full of death-traps; in addition to surviving and outsmarting the traps and attacks of the manipulated environment, the rule is only one can leave the arena alive. So they also have to fight and kill each other. This is done each year to punish the Districts for a rebellion that occurred over seventy years ago, resulting in the virtual enslavement and poverty of the Districts, while those in the Capital live a life of pleasure and luxury. Read for 48 Hours Book Challenge. I have never wanted to read a book so much! It sounds stupid, but waiting is causing me almost physical pain. I'm sure it will be worth it. I just can't handle the wait. The Hunger Games is so well written.